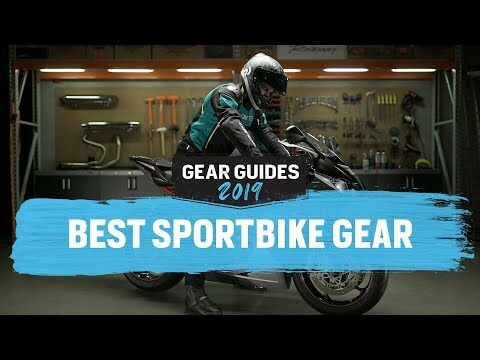 Riding a sport bike in tennis shoes is not always the best, safest or most comfortable way to ride, but then again neither is wearing a full race boot. 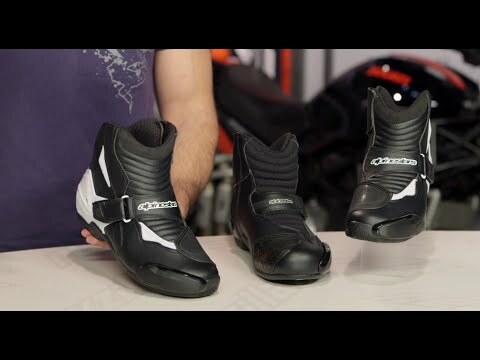 To split the difference the Alpinestars SMX-1 R Boots are designed to bridge the gap, blending the protection and features found in Alpinestars' race boots with a low-top design that is comfortable and easy to wear. 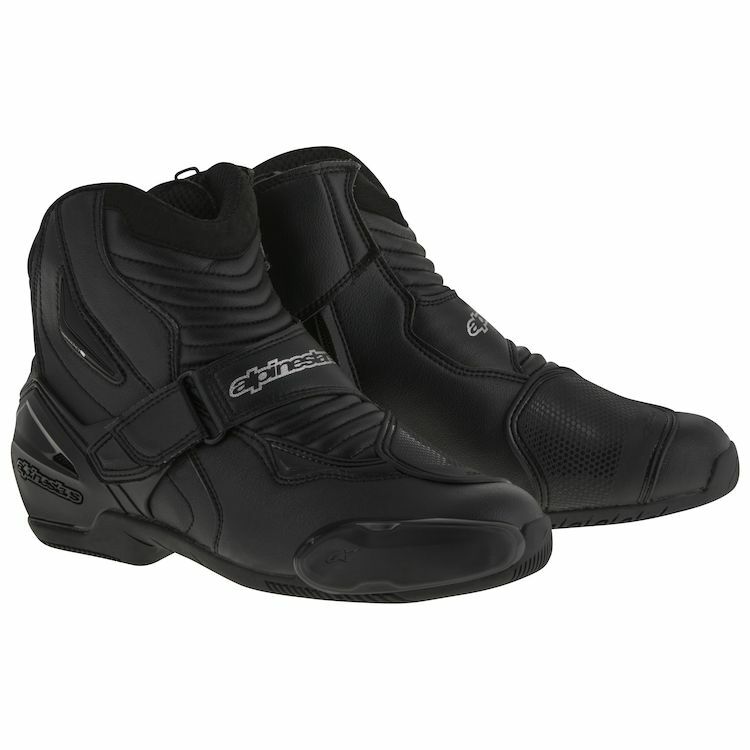 Constructed from a lightweight and abrasion-resistant microfiber upper and is reinforced with strategically positioned TPU protectors the SMX-1 R features an evolutionary new rubber compound sole with superior grip patterning for excellent grip both on and off the bike, while the accordion flex zones give support and control regardless of your riding position. You can’t really tell that you’re wearing motorcycle boots. Really nice and comfortable!! I like these boots they are comfortable and made me not break my ankle when I went down last year. However, after a few months the toe guard fell off and I can not find a replacement anywhere, I don’t really need to replace it; it just looks better with it on. After I went down the zipper kind of got messed up and it hard to close. I am totally going to but another pair of these short A-stars boots, maybe a different model. Overall great beginner boot it will save your ankles! This is my first set of boots. They are very high quality! Although the size chart is a bit off. I fit a 10 in US size so I got a size 44 (9 1/2 US) because I hear they run large and they weren’t lying! Ended up getting a size 43 and fit perfect! Also some of the fastest shipping and great customer service! I wanted black boots in a 10 wide size that would cover and protect my ankles but would not be as tall as full riding or cowboy boots and would provide better protection than leather Converse high tops or mid tops. These boots (size 44) are just what I needed. They provide good width and comfort. Can’t really wear them all day in an office setting due to the protective pieces on the outside of the toes as well as the company logos, but they would be comfortable enough to do so. A little tight to slip on, but nothing extreme, and easier than cowboy boots. Great boot, but BROKEN ZIPPER TWICE! I really liked this boot. super comfortable and stylish. I really liked the ease of putting them on and taking them off, however....a huge complaint I have is that the zipper pops off the track really easily!! I got my first pair in July and they broke in September via zipper popping off! revzilla replaced them under warranty with ease and got another pair. a few weeks later. since I have an off season and starting riding again in March of this year they broke again today which is in June! This is my second pair of them, within a year and I am not sure I want to get them again due to the zipper failure. like I said they are great boots especially for the money but if you're not careful with the zipper everytime you put them on, it will break! be careful! sizing runs a little big If I remember correctly. i am a size 10.5 US and a size 43 fits perfect! I didn't care of these boots at all -- got them delivered to me, tried them on and walked across the living room carpet, and sent them back to Revzilla.com, who graciously and promptly refunded my $$. I have another pair of Alpinestar books (high boot, totally different style) with which I'm extremely happy. These SMX-!R boots are just off the mark, as far as I'm concerned. But many thanks to Revziilla for providing such outstanding customer service. It's one of the several reasons I keep coming back and ordering my gear from them. 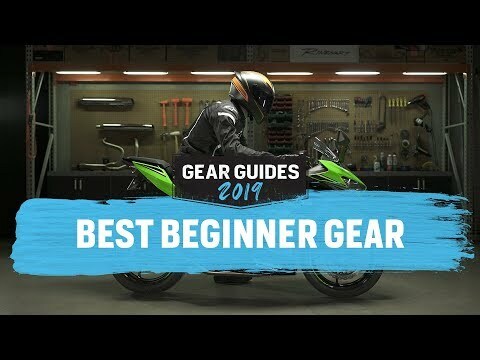 So am a new rider and I was looking for some boots at a good price and that could do the job of protect me in case of a fall, well I gotta say It saved my feet on my first fall. I was riding my motorcycle on a left corner at about 30mph and the rear tire slip so I fell down and end it up on the side walk. The boots worked perfect, they took all the scratch for my feet and they protected very well. They are really comfortable for every day ride and look really well. In summary am really satisfied with the boots. For reference in nike shoes am a 10 in US size but for this boots am a 9 in US size. I really enjoy the style and fit of these boots. These are my very first pair and I am a novice rider and they do not hinder my braking/shifting in the slightest. They are comfortable to walk around in. The only negative I have to say about them is they tend to dig into my shins a bit if I am not wearing long socks, but I imagine this is normal for this type of boot. First of all, these are great boots if you don't want to wear full height boots. Fits great, but could use a bit of arch support. Just enough flex to not walk like a robot, the rubber is non-slip and leather is very well put together. The reason I am asking for Warranty service from A-stars is that the left boot is showing separation of the YKK zipper and the leather after a few weeks of use (no more than 20 times worn). Independently, YKK is a great zipper product, and A-stars is a great boot. Unfortunately, the two didn't mesh together on this particular boot. Granted, the zipper is THE part that gets the most use. I just sent an email to A-stars (as advised by the customer rep at A-stars) including a description of the issue, photos, and the receipt (PDF of the Revzilla order/payment page). We'll see how it goes. I have always been pleased with A-stars products for both function and style and would like to stay with them, if at all possible. But this failure of a critical part of the boot is a bit disappointing as I have to wear the boot half-zipped (zipper won't go any further). In an unfortunate scenario of a crash, the boot feels like it will fly off. Other than that.... it's a great boot. Again, let's see what A-stars can do to rectify the situation. If the result is satisfactory, boost the rating to a 4.